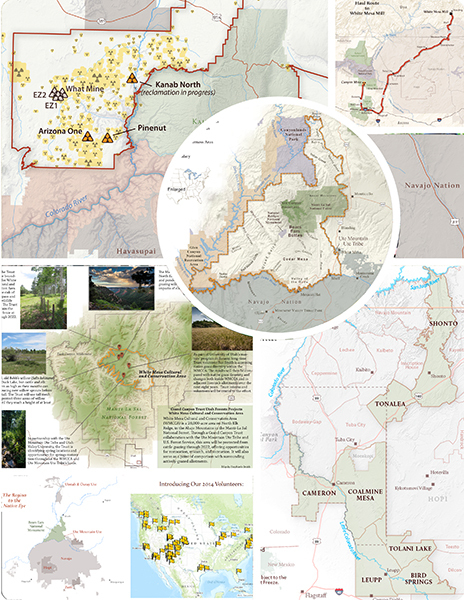 Map of the Month: meet the nerd behind the Trust maps for an insider glimpse into the world of cartography in this monthly blog series. On December 4, President Trump signed proclamations slashing two national monuments in the heart of the Colorado Plateau--Grand Staircase-Escalante National Monument and Bears Ears National Monument. Trump’s actions came as no surprise though, given announcements months earlier that such alterations were in the works. As I began my coffee routine the morning of Trump’s speech, I felt as sense of strength and readiness to apply my craft in defense of the landscapes I love. I naively thought that having had a heads up would soften the blow. I thought that finally having answers, after months of waiting and guessing what the new boundaries might be, would bring a sense of relief. I was wrong. The new boundaries brought little relief to me personally, and no relief to the remarkable landscapes excised from each monument. Relief in the cartographic sense is the raised representation of Earth’s surface that shows topographical changes across the landscape. For Grand Staircase-Escalante and Bears Ears, this means tall mesas, deep canyons, and sharp cliffs. But Trump’s new boundaries cut out much of the topographical relief, leaving strange disconnected pieces behind. As I sat there listening to the president’s speech, my heart grew heavier and frustrations began to boil. How was I going to graphically depict the magnitude of lands suddenly missing from our monuments? With my computer mouse in hand, I slashed areas that I love from the map. For what seemed like ages, I stared at the screen, contemplating how I could represent the boundary changes so that others would see what I was feeling — no relief. The only thing that came to mind was too much white space, not enough relief. Want to backpack in the Grand Canyon? Check out our newest map of backcountry routes. A glimpse into mapping the slashed boundaries of Grand Staircase and Bears Ears national monuments. Turns out protecting Grand Canyon springs for animals like bobcats, hawks, and bighorn sheep, requires some heavy lifting.